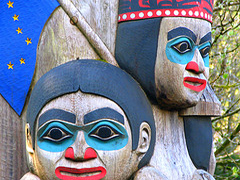 Anchorage - Alaska Sightseeing Travel Guide: Anchorage is the perfect gateway to explore Alaska. Travel to Prince William Sound for a Glacier Cruise, visit Kenai Fjords National Park, try some Salmon Fishing on the Kenai Peninsula or take a Alaska Railroad Tour to magnificent Denali National Park. Alaska at it's Best ! Let our driver-guide show you some of Anchorage's historical points of interest in this sprawling city of over 250,000 full-time residents. Watch for attractions like the Log Cabin Visitor Center and its Crossroads of the World Signpost. 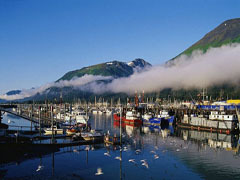 Then it’s off to the historic Port of Alaska and Ship Creek area where our city was born. Here you’ll learn about Anchorage’s colorful pioneer history, our early tent city, what life was like here before the age of modern conveniences and how Anchorage got it’s name. Next we’ll travel past Bootleggers Cove, stopping for a visit to Earthquake Park and Lake Hood airport: the busiest seaplane base in the world. The Chugach Mountains are our last and finest stop. Here you’ll experience Anchorage from the place locals go for stunning vistas and beautiful sunsets. This stop provides beautiful views of the city of Anchorage, the Cook Inlet and the Chugach Mountains. The 26 Glacier Cruise travels over 135 miles into Prince William Sound where you will see 26 “named” glaciers and many more unnamed. We get within 2 tenths of a mile from the face of these towering masses of ice so you can “hear” the glaciers move as well as see the brilliant blues in the ice. Glacier calvings are normally seen on each cruise. The types of glaciers you will view are Alpine (hanging), Piedmont and Tidewater Glaciers. You may view sea otters, seals, porpoises, sea lions and whales during the cruise. The most common whales in Prince William Sound are Humpback and the Orca or Killer Whale. 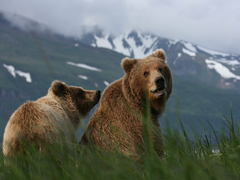 Passengers may also spot wild life such as bear and mountain goats. Of the 200 species of bird inhabiting this area, Bald Eagles are very prominent. Stop at a bird rookery - home to thousands of Kittiwakes. The Alaska Railroad passenger train leaves the downtown Anchorage Depot and travels down the scenic Turnagain Arm of Cook Inlet. On one side of the train you can watch the water for Beluga whales that chase spawning salmon. On the opposite side of the train Dall sheep are often seen on cliffs of the towering Chugach Range. When these animals are spotted, the engineer usually stops the train so passengers can get a good look and some photographs. Upon arrival in Seward, you’ll embark on a 6-hour cruise of Kenai Fjords National Park and its protected waters, rich in wildlife. Cruise past immense glaciers to Fox Island and enjoy a visit to the Kenai Fjords Wilderness Lodge on secluded Halibut Cove. Lunch will be served on board during your cruise. Rugged cliffs and a pebbled beach are just part of the natural backdrop. There's an abundance of waterfowl at Potter Marsh and you might even catch a glimpse of beluga whales along the shores of Turnagain Arm. The sights unfold as you continue on the Seward Highway - voted one of the countries most scenic roadways by Conde Nast Traveler Magazine. Take some time to browse the glaciology exhibits at the Begich-Boggs Visitor Center and learn about the forces of nature that are at work in and around Portage Lake. 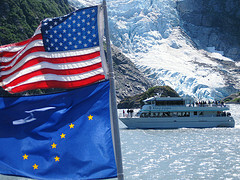 Get a close-up view from the decks of the MV Ptarmigan to Portage Glacier. This sightseeing vessel has been specially designed to navigate the iceberg-dotted waters of the lake to within 300 yards of Portage Glacier. Enjoy the spectacular views and the expert narration from a seat in the enclosed lounge or on the open-air observation deck. On the way back stopover at the Alyeska Ski Resort. A sightseeing tour from Anchorage through the Anton Anderson Tunnel to the port city of Whittier. 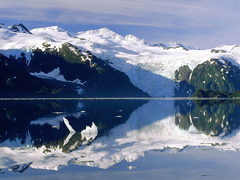 Board a Tour Boat for an unforgettable tour of spectacular Prince William Sound. Glide through glacier-carved fjords to discover up-close the waterfalls and inlets of Esther Passage. As you advance toward the ice-blue face of Surprise Glacier and the ice castles of Harriman Fjord and Barry Arm they seem to grow larger and larger, until they tower over your 90-foot vessel. Floating among the icebergs, you’ll watch the glaciers crack and groan and calve off enormous chunks of ice in a thunderous display. Viewing abundant marine wildlife and learning about the natural history of Prince William Sound makes this adventure memorable. Multiple outside decks for panoramic glacier, scenery and wildlife viewing. Halibut or Chicken Lunch included. Alaska’s backcountry offers some of the world’s best fishing, only minutes away from the city by seaplane. Let us take you on a 10-hour trip to a remote river or stream where the action is and the crowds aren’t. We’ll outfit you to go on your own or with an experienced Alaskan guide. Enjoy a scenic flight over mountains, glaciers, forests and rivers watching for bear, moose, sheep and more. Your destination is a charming lakeside wilderness lodge where you'll meet your guide and get outfitted for the day's adventure. Then you're take off via flat-bottomed riverboat to your guide's favorite fishing holes. Have a delicious lunch back at the lodge or on the river. 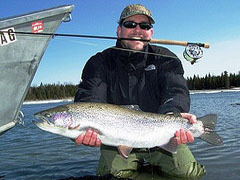 Angle for king or silver salmon, trout or arctic grayling depending on the season. Your catch will be cleaned and packaged at the lodge and staff can assist for smoking and processing. 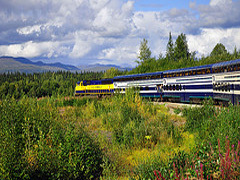 Enjoy Alaska's scenic beauty on a trip with the Alaska Railroad to Talkeetna. Comfortable seating, on-board services and the large picture windows are providing a relaxed environment for the 3-hour trip followed by a magnificent 1 1/2 hour flightseeing tour that takes you around Mt. 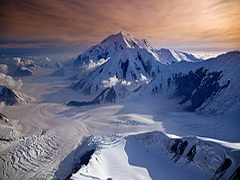 Denali's summit - with 20.230 ft the highest mountain in North America. Enter a world of rugged high mountain peaks and wide glacier filled valleys. 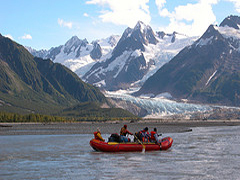 See the Sheldon Amphitheater, beautiful Ruth Glacier, and the world's deepest gorge. Crossing the valley between Mt. Denali and Talkeetna, look for wildlife including moose and bear. 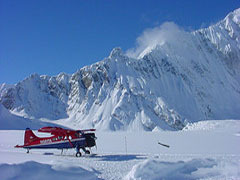 You will land on a glacier (optional) where you will step out on an expanse of ice 4 miles wide and over 30 miles long! Roundtrip transportation from Anchorage with a deluxe motorcoach and luxury domed railcars (Deluxe) included. Travel with the Alaska Railroad to Spencer Glacier and steal away on a very popular and gentle float tour among the icebergs at Spencer Lake and down the Placer River Valley with some rapids that are fun but mild. Be prepared for a true Alaska wilderness experience. Spencer lake is full of icebergs and the ice is so close you can touch it. Professional guides lead the trip which provides great photo opportunities. Rain jacket and rubber boots provided. Please dress warm in layers and enjoy the wilderness. Conditions around the icebergs are chilly. The tour is also available from Girdwood, Whittier and Portage. All tours are including rail/motorcoach return transportation. Depart from Lake Hood - the worlds busiest floatplane base and enjoy a guided tour with the opportunity to view Alaska's brown bears in their natural habitat. We fly about 70 miles (35 minutes) southwest of Anchorage across the Cook Inlet to the entrance of the Lake Clark Wilderness Preserve - a critical habitat area - home of the Redoubt Bay Lodge and incredible bear viewing. An experienced natural history guide will take you by boat through bear country. Look for bears as they fish for salmon, and don't forget to watch for other wildlife along the way. Guests receive a Redoubt Bay Field Guide that provides interesting facts about bears and a checklist of Flora and Fauna specific to this region. Relax and enjoy a homemade lunch on the lake or in the cozy lodge before your return to Anchorage. Total trip length about 6.5 hours.